This Daily Devotional shows Believers Who They Are In Christ. For 30 days we will learn from scripture the many things that we believers have been given and blessed with in Christ. We will see that in Christ we have all we need to live daily and have no need to worry, doubt or fear. As we are reminded daily who we really are in Christ, we can then walk in that knowledge every moment of every day and live victoriously in the world, but not of the world. Sometimes I think we all wonder who we really are, if we are measuring up, or if we are worthy or making a difference. Perhaps we wonder if we will be able to accomplish what we or others expect of us, or if we will have the strength we need for another day. 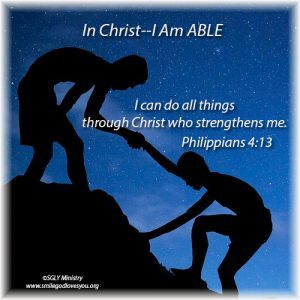 Believers in Christ, the answer to all our wonderings is “Yes”, we are able, worthy, and will find the strength we need every day, for in Christ we can do all things in His strength.